If I had a genie and 3 wishes, my third wish would be for MWM to have a team the size of Blizzard just for CoT. The entire MWM is as ripped as Iron Man’s nemesis Blizzard. They have to spend time and money to buy new clothes, causing a small delay in production. I guess it's a good thing my first wish would be for $$$. Ixnay on the wishing for more wishes, three, that’s it, no exchanges or refunds. Or you could wish to make yourself a free genie...then you get unlimited wishes, right? Don't wish for more wishes, wish for more genies. Sure a "natural-born" genie (for lack of a better term) might have to start with a master. But would a random wish be able to transform an average human into a "masterless genie"? You're not "creating" the human, just transforming them. That project Gorgon game making it to Steam and getting positive reviews is interesting. I have to wonder if we will see CoT or SoH on Steam in the near future. the obvious wish would be to make yourself a powerful wizard then you wouldn't need a genie. Just don't get greedy! I get the impression CoT seems to be playing cautiously and biding their time until they have a fairly impressive project before putting it on display. Not a bad move if you can afford to do it since you only get one first impression and people rarely come back for a second look if they aren't impressed. I do really hope CoT gets to steam when they are ready though. Yes, this has been made clear. And I believe the closer we get to launch the more professional MWM needs to make their image. My computer has a recycle bin, does the Internet? Do you empty it? I'm more partial to mops and brooms, they make for better catchphrases and double as a way to whomp on bad guys in a pinch. While I'm not particularly excited for this game, at all, I am a big fan of their method of communication. They try to be very vocal about devo, their visible timeline is nice, and they always have a lot of visuals with each post. I like it as well. If we had a full time, paid staff as they had, we could make such charts as well. But we are a work-as-available group of unpaid volunteers, so such a chart is counterproductive. Would you or anyone else care to clarify why such a chart like this would be counterproductive? It basically implies that you are incapable of setting goals and meeting those goals. Not really a good perception to be putting out there. Even if you fail to meet the goals, at least people would know what your goals are, and where things stand in the development process. The unfocused trickle of information makes people skeptical, and for good reason. Even if it's not a flashy graphic like this, a trello (which I would hope you are using, or something like it anyway), would be useful to let the community know where things stand, and how they're progressing. It really shouldn't be an extra investment of time to make something public which you already have in use. I don't think this would be counterproductive at all, to the contrary, it would be very productive to reassure the community that you are actually making good progress and using the funds that you raised in an efficient manner, and helpful in raising funds to help get the project finished. Right now, it's anyone's guess as to where you actually are in the development process, and how much more you have left before it is ready for public testing. If you have a kickstarter tomorrow, it's going to be hard to get people to trust you will actually finish the game any time soon, given your track records and lack of information. Knowledge is power, and your reluctance to share what you know about where you are in development is very disconcerting to me. It is counter productive for us. While we have a group of dedicated volunteers - we are all just that - volunteers. It has happened, and is bound to again, where someone is giving a project and that someone drops off the face of the planet. Leaving work incomplete. And since they work remotely, hey may not have uploaded any work to your repo. Leaving it up to someone else to pick up the slack. Most likely that someone else was also already working on something. And that something has to be paused, or both worked on and / off for a long while. Causing production to slow. Also, many of us have other jobs, work from home during our family time (for those of us that have families). Which all god to say is that we put in part time work in what is a full time job. It - until you are forced to. When production hinges on multiple people from multiple departments and one small change can lead to a shift in one person’s time line - it has a cascade effect on others’ time lines, effecting the time line of all production. Eventually, the marketing and sales deptaents settle in a hard date. And all those little set backs catch up with you - resulting in the inevitable “crunch time”. Where people can often times work 80-120 hours a week in order to get the project completed and ready to ship. This is also why lately many games have released with many large bugs that are meant to be patched or later. Ones because they can be parched (unlike days of old) and also because there is no leeeay once that hard date is set. So how theh do you set a hard date with a team of unpaid part-time working volunteers who have no calaciry to handle “crunch time”? The answer is you don’t. You plan an extended time line with rough range of dates to hit milestones in production. If we were to release a chart it would be so nebulous that to the outside - many would think we were crazy and not fully grasp the nature of our work force and how we operate. Only those few who come to the forums and new us would understand. To everyone else who doesn’t understand - would lead to a lot of negativity. And that is detrimental to us. Not all management needs that degree of structure. Many might find a chart like this an added stressor that interferes with their workflow. This is especially true for more independent pesonalities who favor autonomy and personal responsibility over an imposed structure. I have worked for companies that didn't use these types of charts and didn't even have "Staff meetings"... for years without issue!! And that was a job where some of the projects involved would change day to day while others never shifted. Often, certain personalities need charts as this provides them with a sense of direction and tangible results. This is a fine approach for those individuals. However, when they are in a leadership position, they often fail to see that it may not be helpful for ar least 1/2 of their staff. (I hate to bring in Dunning-Kruger but ...) When this happens the company will self-select for individuals who are more "charty" types, perpetuating and erroneously validating the process as a universal. So while I would like a small less detailed chart myself, I respect the process to workflow MWM has taken. It appears to be thoughtful, supportive and respectful if it's members distinctive creative styles and work ethics. You could see this as the last PAX conference. Each team had a distinctive management approach. I find MWM's to be the one that was most respectful and likely to be the one that will have the integrity to follow through in their promises of quality over drive/pressure for immediate gains. Missing schedule dates is completely understandable, especially with a volunteer crew. However, refusing to actually tell people what is done and what is not, and what you hope to have done at some time in the future, is very hard to understand for me. Unless there is and embarrassingly little amount actually done, in which case, I guess it makes sense. Therein lies the rub. If you refuse to be transparent, people are left to make assumptions, and some of those assumptions can be quite negative. Again, if you want to raise funds in the future, you need to let people know where things stand, and show that you've actually made progress all these years. The character creator demo is a great indication of that, as well as some of the other updates you've made, but in terms of the rest of the game, no one knows where things stand, whether you have a full city actually built yet, whether you have one or more powersets finished, etc. Just general broad strokes of what is in the works would be tremendously helpful to building more support and trust, and assuaging the lingering doubts that people have about the project, even if there is no specific timeline attached to it. This is just my view and I’m sure others will disagree. One of the worst things a person can do is encourage false hope. I don’t mean lying, I mean suggesting something will be one way when they can not control that outcome absolutely. To give a timeline with hard dates is fine. It encourages us to hope that everything will go along a planned course. It also gives us the ability to gage, develop opinions, and criticize every little detail that we perceive as a failure or debilitation of meeting the “timeline” goals. I have done volunteer work and I’ve been there when literally two of fifteensupposed volunteers managed to show up. It’s not easy to plan for this. And what is more all of those volunteers had good reasons for not making it to the event. There were no excuses or laziness at hand, each had valid reasons. It was simply horrible timing for the event. Had the people the work was being done for not known it was suppose to happen the press for it wouldn’t have been nearly so horrid. But they did know and the group took a great deal of heat both locally and nationally as a result. In a situation where everything is fully supported and tangible I agree a timeline is not only a good idea but a wise tool to employ. However, when dealing with a situation where the entire support staff is unpaid and voluntary there is no way to know that even one goal is reasonably achievable in a given timeframe. So does one put up a timeline full of hopeful dates and good intentions under the guise that a staff of unpaid volunteers will manage to operate unhindered by “life” and be on time with every part they support or does one play it close to the vest and not show cards without enough certainty that they have a winning hand? Don’t get me wrong I would love to find out the game is further along than they have shared with us. However since the alternative to knowing is what I’m already doing which is waiting (patiently?) I don’t see the problem with being in the dark as opposed to getting a list of timeline goals that are all missed simply because they threw out a “timeline” they they couldn’t possibly know they could achieve. Thus providing yet another tool for criticisms from “supporters and well wishers.” All of this when they are already working against tremendous odds (highly decentralized unpaid volunteer staff) to achieve their goal. I really don’t think the MWM group as a whole has any intention of failing or not giving their best but they aren’t organized in a fashion that permits a wise choice to share their timeline. I’m sure they do have one but I wouldn’t expect to see it until they were certain they could commit and hit the dates given. Especially since so many onlookers in the gaming community are so very skeptical and critical of every little detail. Just look at these forums and see how critical the supporters are from time to time... let alone the full community. Unless there is an embarrassingly little amount actually done, in which case, I guess it makes sense. Therein lies the rub. If you refuse to be transparent, people are left to make assumptions, and some of those assumptions can be quite negative. Normally the developers wouldn't, and maybe shouldn't care, what assumptions people make. But I agree with your sentiment since CoT is a unique game in that it is KS funded and staffed by volunteers. I don't think they can afford to be cavalier with people's assumptions since they are planning a 2nd Chance fundraiser and the success of the game will largely be CoH player base and word of mouth. We don't know where all the KS money went all these years later but I doubt they'll be budgeting a whole lot for marketing when they could use that money on the already under-funded game. I like to think that I have as much faith in the dev team as possible given the relatively little amount of the actual game we've seen. I can't imagine they would open the 2nd Chance fundraiser without having a working chargen, and videos proving that, along with some actuall gameplay showing completed effects, combat, the actual city and world, etc etc etc. At least, that's what I need to see to donate money. I'm not putting a time-frame on that, just my personal requirements whenever that happens. Everything LOOKS promising, but we've actually only seen very, very little. And that's ok as long as they aren't stringing us along. 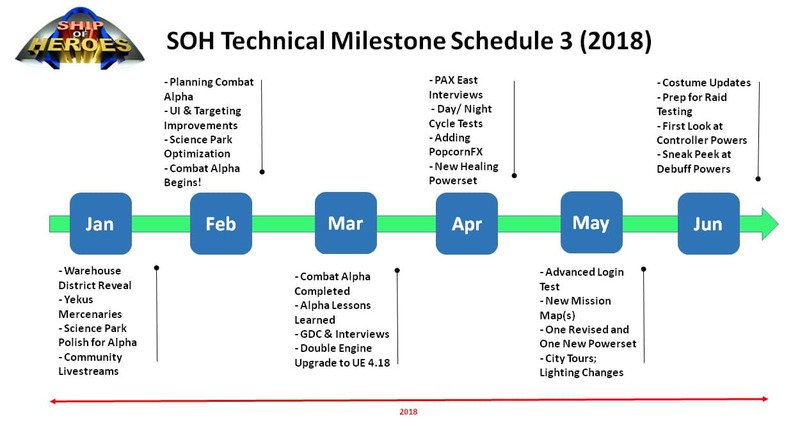 Seriously though, I'm not saying the need a timeline like SoH has, but just a basic list of things they have completed, and another list of things they hope to complete at sometime in the future, would be stupendous, and again, something I hope they already have. Trello is a great medium for this, as can be seen in other games, where they have basic categories of "done", "in progress", and "maybe someday". It's not difficult to make if they don't have it already (which if that's the case, that's alarming), and would be tremendously beneficial, both in terms of keeping track of the project for themselves, and for keeping the community informed. A simple thread, with admin only posts of the latest version of it is all it would take to make this idea a reality. I think it's more of an issue that due to their uneven development speed and high potential for completely unannounced loss of devs that having a public display of what is "in progress" and such can be more detrimental than beneficial since it can leave a feeling in many of us of "why isn't that done by now" when features aren't done in a time frame that we would think is the proper one. My experience purely on the consumer side of this leans towards that putting up these kinds of "lists" actually necessitates more active communication from the devs to makes sure that what we read on those lists have all relevant information. There's also the fact that not everything they track internally would be a good idea to put on such a public list. A list of what’s done, what’s in progress, what won’t be done until post-release, and what is probably never being added or might never be added, that’d be pretty neat, even if there are zero dates added. If they already have that info at hand for their internal processes and can reproduce that here, I think I’d like that. 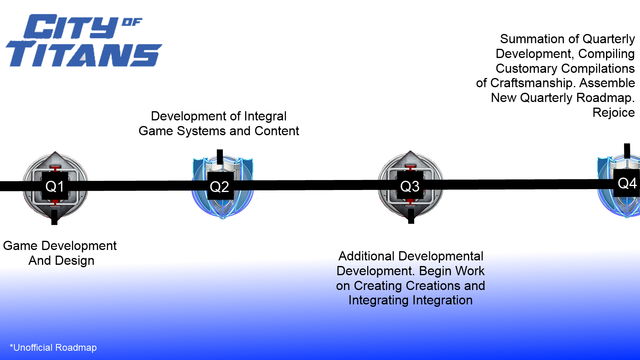 But if that’s something they don’t have already, because they are working as independent groups focused on different modules to be integrated later, and compiling that info requires taking resources away from development then I’d rather they focus on getting Chargen and the game itself done. Ohh I'm sure they have such I just think they are much more fine grained than what would be "suitable" for us, possibly going down to individual items/powers rather than "groupings". I'm sure there are a few "devs" (well at least one) that doesn't do any actual work on the game itself but rather all the things around it, like coordinating and/or prioritizing all the different work being done. This comes back to something I've said before: Every player thinks they want to see how the sausage is made as far as all the details related to how this game is being designed and scheduled. But in reality the more "details" we learn at any given moment about those things the more likely those things are going to change and/or be modified six months or a year from now when (hopefully) public beta testing is underway. Speaking of goals, still waiting for that VO Steam release that was slated for a year or two ago. Apparently, VO was due on Steam. Players would also be able to customize their transformations for that said power-set, and pets for the commander power-set. They discussed a power-set were players could transform to something else, and customize it. Sounds too good to be true!!! (Sarcasm). Apparently they released in 2017, guess I missed it. Depends on your goals, because they could definitely lead players in the wrong direction. May be better to say nothing at all. 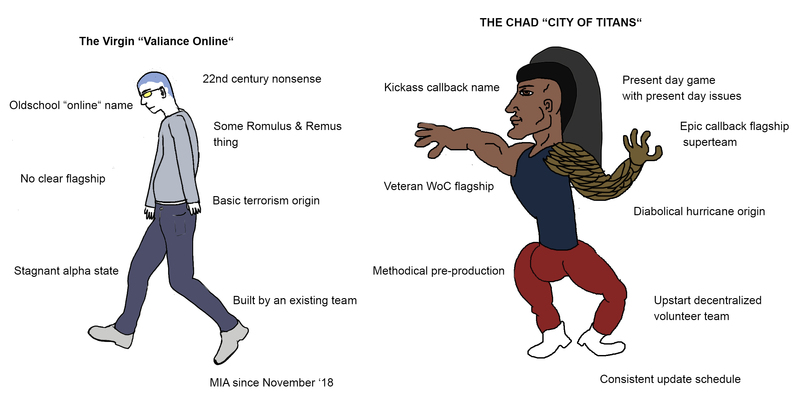 VO has nothing that resembles a transformation power in their current plans or alpha. They actually stopped discussing customization of pets and transformations altogether. If they only would have said nothing? So it turns out VO is sort of still going? They promise to livestream a pet power at the end of November. Not really interested in the power to be completely truthful, I just want to see if they will follow through with a promise, any promise. They have never been on schedule. Not only that, I don't recall VO has ever fulfilling a previously announced content promise. Curious to see if they follow through. With me, VO is about trust. They announced and promised so much in the past. At this point, the material is irrelevant, but their trust is the focal point for me. I don't really care what they are trying to sell their 5 or 8 fans, just if they deliver. I have heard horror stories from supporters. I feel like this may be their final chance to make an impression. That is, if anyone even cares at this point. What are your thoughts on this project nearly 4 years after this thread was created? I had high hopes for VO a year ago, the alpha was getting regular updates, they had one powerset for minions already, it was a good start. Then they stopped updating, and stopped talking. Really seems like they wasted the time advantage they had. Now I'm investing all my enthusiasm in SEGS. I do not like to think I'd rather had spend my donation/preorder on CoT instead of VO but... well I would really not mind if that would be the case now. *sigh* Thankfully I am not into horse race gambling. They did made a recent update (https://valiance.shogn.net/10-news/36-progress-and-the-path-ahead); but it had a bit of a back to square one feeling to it. I assume that’s his posterior and he’s awkwardly twisting around backwards. 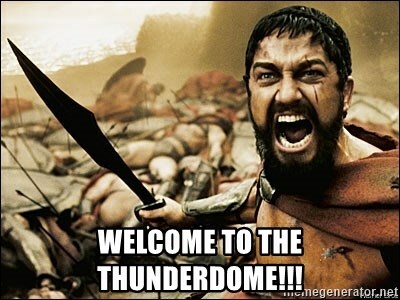 DesViper's gonna make me abuse my brand new forum powers. Yeah, in some corners of the internet, the template is common. If only Valiance Online had a perky, unpaid spokeskitty to rally morale over there. Remember, kiddies: "City of Tabbies … now with more Kittens!" valium online doesnt seem to be advancing, but I could be wrong. Valiance Online are struggling with funding and staffing right now but they are good people. If you have the extra funds I'd encourage people to donate. The meme is heavily ironic: I really don't mean them harm, despite some legit criticism in there. BTW, do *they* have hamburpers?! City of Tabbies does! Full disclosure: I'm a supporter of both games. But I think the current states of Valiance and CoT can largely be attributed to their planning, organization, and strategy. For all the grief MWM gets on these forums from time to time (not all the time, and certainly not from everyone), they've adopted a development approach that seems to be working, and making the most of the dollars they have. And by sticking to their guns, and not campaigning for more funding (at least until they have something more substantial to show for it) they've also enhanced their credibility. All those aspects of their business model are inter-related, and mutually supporting. Valiance got a lot of props for having a playable pre-alpha several years ago, but in terms of actual game play, they've not made much visible progress since. Their game world has gotten nicer, and there have been some steps forward in character creation, etc. But I think it's fair to say that they've stalled. Working with a volunteer team has its hazards and drawbacks, and may eventually lead to even more headaches for MWM down the road. But they continue to show impressive progress, even if it's not all come together quite yet. At this point, my faith and expectations are all with MWM and CoT, largely because I still believe in their development plan and business model. Two thumbs … um … dew claws … up!